Objective Alcoholic hepatitis (AH) is a severe clinical condition that needs novel therapies. The identification of targets for therapy is hampered by the lack of animal models of advanced AH. The authors performed a translational study through a transcriptome analysis in patients with AH to identify new molecular targets. Design Hepatic gene expression profiling was assessed by DNA microarray in patients with AH (n=15) and normal livers (n=7). Functional analysis was assessed by gene set enrichment analysis. Quantitative PCR was performed in patients with AH (n=40), hepatitis C (n=18), non-alcoholic steatohepatitis (n=20) and in mouse models of acute and chronic liver injury. Protein expression was assessed by immunohistochemistry and western blotting. Results Gene expression analysis showed 207 genes >5-fold differentially expressed in patients with AH and revealed seven pathways differentially regulated including ‘cytokine–cytokine receptor interaction’. Several tumour necrosis factor (TNF) superfamily receptors, but not ligands, were overexpressed in AH. Importantly, Fn14 was the only TNF superfamily receptor exclusively upregulated in AH compared with other liver diseases and correlated with both 90-day mortality and severity of portal hypertension. Fn14 protein expression was detected in areas of fibrogenesis and in a population of hepatocytes. Fn14 expression was increased in experimental models of liver injury and was detected in progenitor cells. Conclusion Translational research revealed that TNF superfamily receptors are overexpressed in AH. Fn14, the receptor for TNF-like weak inducer of apoptosis, is selectively upregulated in patients with AH. TNF superfamily receptors could represent a potential target for therapy. Alcoholic hepatitis (AH) is a severe form of alcoholic liver diseases that carries a poor short-term prognosis. Current therapies to treat AH (eg, corticosteroids) are not fully effective in many patients and targeted therapies are urgently needed. CXC chemokines are overexpressed in livers from patients with AH and may represent novel targets for therapy. Tumour necrosis factor α is overexpressed in animal models of moderate alcoholic liver disease. There are seven pathways differentially regulated in patients with alcoholic hepatitis (AH) compared with normal livers including ‘focal adhesion’, ‘cell cycle’ and ‘cytokine–cytokine receptor interaction’. Tumour necrosis factor (TNF) superfamily receptors, but not ligands, are markedly overexpressed in patients with AH. Fn14 is the only TNF superfamily receptor exclusively upregulated in AH compared with other liver diseases and correlates with both 90-day mortality and severity of portal hypertension. The identification of potential novel targets for therapy will stimulate the development of new targeted therapies for this severe clinical condition and will help the design of new clinical trials. Patients admitted to the Liver Unit of the Hospital Clínic, Barcelona (2007–2009), with clinical, analytical and histological features of AH were prospectively included. The inclusion criteria have been previously described.13 ,24 ,25 All patients had histological diagnosis of AH. Patients with malignancies or any other potential cause of liver disease were excluded from the study. Liver biopsies were obtained using a transjugular approach. As controls, we included patients with chronic hepatitis C-induced liver disease (HCV) (n=18). All patients had HCV genotype 1 and did not receive previous antiviral treatment. We also included a cohort of patients with morbid obesity and associated non-alcoholic steatohepatitis (NASH) (n=20) according to Kleiner's criteria (supplementary table 1).26 A laparoscopic liver biopsy was obtained in these patients during bariatric surgery. In all patients, liver specimens were analysed by an expert liver pathologist and a part of the biopsy was submerged into a RNA stabilisation solution (RNAlater, Ambion, Austin, Texas, USA). The protocol was conformed to the ethical guidelines of the 1975 Declaration of Helsinki and was approved by the Ethics Committee of the Hospital Clinic of Barcelona and only patients with signed informed consent were included. Fragments of normal livers were obtained from optimal cadaveric liver donors (n=3) or resection of liver metastases (n=4). All controls had normal serum aminotransferase levels and normal liver histology (supplementary table 2). Criteria to obtain normal livers were: (1) no past history of liver disease, alcohol abuse or metabolic syndrome; (2) absence of maintained arterial hypotension before laparotomy; (3) normal serum levels of aminotransferases; (4) time of brain death to laparotomy less than 12 h; (5) normal liver histology; (6) no use of vasodilator drugs; and (7) liver specimens obtained immediately after laparotomy and before vascular clamp. Samples obtained during resection of liver metastasis were obtained at a minimum distance of 5 cm from the tumour. A subset of patients with severe AH based on clinical criteria (Maddrey's discriminant function >32) (n=15) was randomly selected to perform DNA microarray analysis. The epidemiological, clinical and analytical characteristics of this subset of patients were representative of the whole series of patients (n=40, table 1). High quality RNA samples were hybridised to GeneChips (Affymetrix Hgu133plus, Affymetrix, Santa Clara, California, USA) and a functional analysis was performed with the resulting data (see details in supplementary Materials and methods). Quantitative real-time PCR (qPCR) was performed as previously described using commercial primer-probe pairs (Applied Biosystems, Foster City, California, USA) for CXCL3, CXCL4, CXCL5, CXCL6, CXCL10, Fas, TNFRSF12A (Fn14), CXCL1 (Gro-α), IL-8, CCL2 (MCP-1), osteoprotegerin, CCL5, TNFα, TNFRSF1, TRAF1, TRAF3, TRAILR1 and TNFSF12 (TWEAK).27 Data were normalised to 18s and gene expression values were calculated based on the ∆∆Ct method. The results were expressed as 2−ΔΔCt. Paraffin-embedded liver sections were incubated with anti-Fn14 (1:40 overnight at 4°C, Abcam, Cambridge, UK), anti-epithelial cell adhesion molecule (EpCAM) (1:100 for 2 h at room temperature, Dako, Glostrup, Denmark), anti-pan-cytokeratin (1:4000 for 1 h at room temperature, Dako) and NF-κB p65 (1:50 overnight at 4°C, Cell Signalling, Beverly, Massachusetts, USA) primary antibodies. Western blot studies were performed using standard procedures. Membranes were incubated with antibodies against AKT, phospho-AKT (Ser473), p38 MAP Kinase, phospho-p38 MAPK (Thr180/Tyr182) (Cell Signaling) and reprobed with GAPDH (Abcam). After washes, membranes were incubated with horseradish peroxidase-conjugated secondary antibody. Proteins were detected by enhanced chemiluminescence (Biological Industries, Beit-Haemek, Israel). Male C57BL/6 mice were used to obtain 250 μm slices from fresh liver sections using a Vibratome VT1000S (Leica Microsystems, Wetzlar, Germany). Samples were washed in PBS, soaked in 4% agarose solution (Ultrapure LMP Agarose, Invitrogen, Carlsbad, California, USA) for 20 min, and then orientated, mounted and immobilised using cyanoacrylate glue. Tissue slices were placed on organotypic tissue culture plate inserts for up to 24 h (Millicell®-CM; Millipore, Massachusetts, USA). Tissues were maintained at 37°C in a 5% CO2 humidified incubator using 1.1 ml of Williams’Medium E (Sigma-Aldrich, St. Louis, Missouri, USA) supplemented with 1% inactivated fetal bovine serum, 2 mM L-Glutamine, 50 U/ml penicillin, 50 μg/ml streptomycin, 0.1 μM insulin, 15 mM HEPES and 50 μM β-mercaptoetanol for up to 48 h. After 24 h in culture, tissue slices were incubated with TWEAK (R&D Systems, Minneapolis, Minnesota, USA), TGFβ1 (Sigma-Aldrich), TNFα (R&D Systems) and lipopolysaccharide (LPS, Sigma-Aldrich) for 24 h. Slices were then transferred to a 1.5 ml tube and homogenised with a polypropylene pestle in 1 ml Trizol®Reagent and total RNA was obtained. Different models of acute and chronic liver injury were performed including carbon tetrachloride (CCl4), 3,5-diethoxycarbonyl-1,4-dihydro-collidin (DDC) and acetaminophen administration (see supplementary Materials and methods for details). Moreover, we used a model of acute and acute-on-chronic ethanol-induced liver injury. In the acute model, male Balb/c mice (n=10) were fasted for 8 h with free access to water and then gavaged a single dose of 50% ethanol (5 g/kg body weight) or water. Animals were sacrificed 8 h after gavage. In the acute-on-chronic model, male Balb/c mice (n=10) were intraperitoneally administered with CCl4 (Sigma-Aldrich; diluted 1:4 in oil) or vehicle (oil) at a dose of 0.5 ml/kg body weight twice per week for a total of five injections. Two days after the last CCl4 injection, mice were fasted for 8 h with free access to water, and then they were gavaged a single dose of 50% ethanol (5 g/kg body weight) or water and sacrificed 8 h after gavage. In all animal models, livers were excised and collected for RNA extraction and immunohistochemistry. All animal procedures were approved by the Ethics Committee of Animal Experimentation of the University of Barcelona and were conducted in accordance with the National Institutes of Health Guide for the Care and Use of Laboratory Animals. Continuous variables were described as means (±SE) and were compared using Student t test or Mann–Whitney U test, as appropriate, depending on their normality test. Differences between categorical variables were assessed by Fisher's exact test or the χ2 test with Yates correction for continuity, when necessary. Correlations between variables were evaluated using Spearman's ρ or Pearson's r, when appropriate. In order to identify those molecules associated with short-term mortality (90 days) we fitted a Cox univariate regression analysis. We did not perform a multivariate Cox regression analysis because of the high risk of overfitting due to the scarce numbers of events (n=11) in our sample, according to a proportion rule of variables/events of 1:10. The area under the receiver characteristic curve (AUROC) analysis was used to determine the best cut-off value and the accuracy (sensitivity and specificity) of continuous variables associated with 90-day mortality. Finally, we performed a comparative risk analysis using the Kaplan–Meier method. Comparisons were performed by the log-rank test. All statistical analyses were performed using SPSS V.14.0 for Windows (SPSS Inc.). We prospectively included 40 patients with clinical, analytical and histological characteristics of AH. Thirty patients (75%) developed at least one major complication during hospitalisation: two-thirds presented ascites and almost a half of the patients developed bacterial infections, whereas only a minority developed renal failure, encephalopathy or variceal haemorrhage. The majority of patients had severe sinusoidal portal hypertension and 78% were classified as severe AH (ABIC score >6.71) at admission (for ABIC score calculation see: http://www.lillemodel.com/score.asp?score=abic).25 The majority of patients had moderate or severe steatosis (69%) of diffuse distribution, marked hepatocyte ballooning (61%) and marked necro-inflammation (37%). The main general characteristics of patients are depicted in table 1. Gene expression profile analysis was first assessed in a representative subgroup of patients with severe AH (n=15) that was obtained from the original cohort (n=40). This analysis revealed 207 genes >5-fold differentially regulated in patients with AH compared with controls. The most upregulated genes that were differentially regulated are shown in table 2. Unsupervised clustering analysis allowed a clear differentiation in gene expression between livers with AH and controls (p<0.001) (figure 1). All patients with AH clustered together and showed a homogeneous pattern of gene expression. Functional analysis assessed using the gene set enrichment analysis program and the Kyoto Encyclopedia of Genes and Genomes pathway database revealed seven pathways differentially regulated in patients with AH including the cytokine–cytokine receptor interaction pathway (table 3). Full microarray data have been deposited in NCBI's Gene Expression Omnibus (accession number GSE28619). Microarray data of patients with alcoholic hepatitis (n=15) compared with control livers (n=7). The intensity of each colour denotes the standardised ratio between each value and the average expression of each gene across all samples. Red coloured pixels correspond to an increased abundance of the transcript in the indicated sample, whereas green pixels indicate decreased transcript levels. Because cytokines are currently considered potential targets of therapy in patients with AH, we focused on the cytokine–cytokine receptor interaction pathway (figure 2). First, the microarray data confirmed previous results from our group indicating that CXC chemokines are markedly overexpressed in AH.13 ,24 Second, we found that some CC chemokines including MCP-1 were upregulated in these patients while others remained unchanged. Interestingly, none of the agonists belonging to the TNF superfamily (including TNFα and Fas ligand) were differently expressed in livers with AH. In contrast, several TNF superfamily receptors (eg, FAS, TRAILR1 and Fn14) were markedly overexpressed. To confirm the results obtained in the microarray analysis, we measured the expression of selected genes by quantitative PCR in our series of patients with AH (n=40) and in patients with other liver diseases including chronic hepatitis C (n=18) and NASH (n=20). 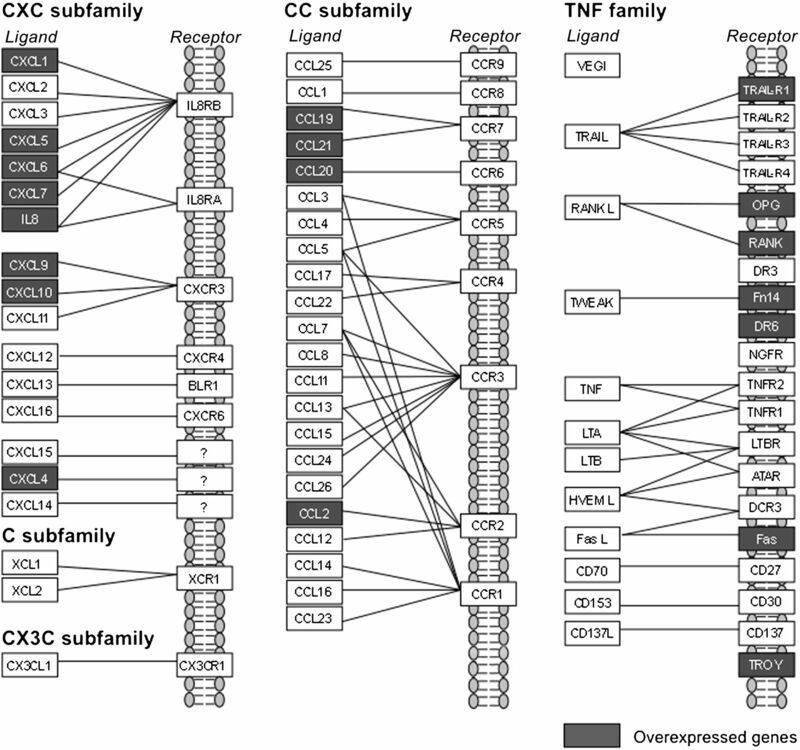 Validated genes included seven CXC and two CC chemokines and genes belonging to the TNF superfamily (Fas, Fn14, TNFα, TNFRSF1 and TRAILR1). The expression of the selected genes assessed by qPCR corroborated the results obtained with the microarray studies (p<0.01 for all). Among TNF receptor superfamily, both Fn14 and TRAILR1 were markedly overexpressed in AH compared with normal livers (p<0.001) (figure 3A). Importantly, the only TNF superfamily receptor exclusively overexpressed in AH was Fn14. Fn14 was nearly 20-fold overexpressed in AH, downregulated in chronic hepatitis C and unchanged in NASH, suggesting that it may play a specific role in AH. Moreover, we confirmed that TNFα, FAS and TNFRSF1 are not increased in our series of patients with AH compared with normal livers. While TNFα was increased in chronic hepatitis C (p=0.0002) and NASH (p=0.02), TNFRSF1 and FAS were exclusively upregulated in patients with NASH (p<0.0005). Finally, we measured the expression of TNFR-associated factor (TRAF) consensus binding motif contained in the cytoplasmic tail of most of the TNFR superfamily members including Fn14.21 We found that TRAF3, but not TRAF1, was increased in AH (figure 3A). Gene expression of the members of ‘cytokine–cytokine receptor interaction’ pathway in patients with alcoholic hepatitis (AH). In grey colour, ligands and receptors that were found upregulated in patients with AH. 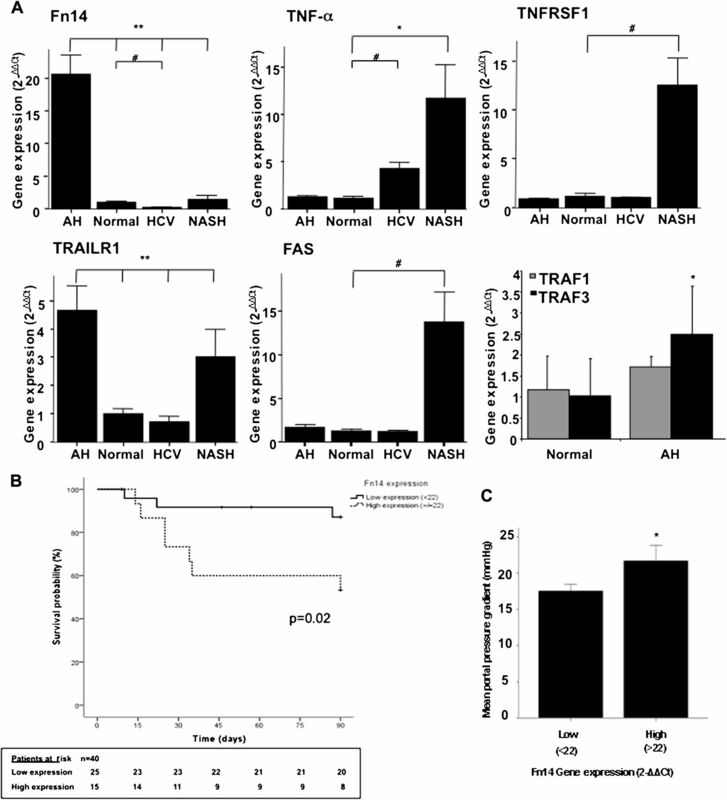 (A) Fn14, TNFα, TNFRSF1, TRAILR1 and FAS gene expression in patients with alcoholic hepatitis (AH) (n=40), HCV (n=18) and non-alcoholic steatohepatitis (NASH) (n=20) compared with normal livers (n=7) (*p<0.05; **p<0.005; #p<0.0005); TRAF1 and TRAF3 gene expression in patients with AH compared with normal livers (*p<0.05). (B) Kaplan–Meier curve showing 90-day survival according to Fn14 gene expression at baseline. A value of 22-fold expression with respect to controls was identified as the cut-off value with better sensitivity and specificity to define patients with low and high Fn14 gene expression. (C) Severity of portal hypertension among patients with low (<22-fold) and high (>22-fold) Fn14 gene expression (*p=0.04). Because Fn14 was the only TNF superfamily receptor exclusively overexpressed in AH (figure 3A), we next explored the correlation between Fn14 hepatic expression and key clinical events. We explored whether baseline hepatic expression of Fn14 correlates with short-term survival in patients with AH. Cox regression analysis showed that hepatic gene expression of Fn14 (HR: 1.05, 95% CI 1.00 to 1.11, p=0.03), IL-8 (HR: 1.14, 95% CI 1.02 to 1.26, p=0.019), CXCL-5 (HR: 1.01, 95% CI 1.004 to 1.02, p=0.006), CXCL1 (HR: 1.001, 95% 1.00 to 1.003, p=0.018) and CXCL6 (HR: 1.01, 95% CI 1.004 to 1.03, p=0.009) was associated with 90-day mortality. The best cut-off level for Fn14 gene expression was 22 (2−ΔΔCt) (AUROC: 0.72; sensitivity 75% and specificity 62%, data not shown). Kaplan–Meier survival analysis was performed to compare 90-day mortality according to hepatic expression of Fn14 in patients with AH. Patients with higher Fn14 gene expression (>22) had worse 90-day survival than patients with lower hepatic gene expression (p=0.02) (figure 3B). We next explored whether Fn14 expression correlated with the degree of portal hypertension, a major determinant of mortality in patients with AH. Patients with high (>22-fold-expression) Fn14 gene expression showed more severe portal hypertension than patients with low expression (<22-fold-expression) (HVPG 21.5±2 vs 17.5±1 mm Hg, respectively; p=0.04) (figure 3C). Importantly, Fn14 and TRAILR1 hepatic gene expression correlated with the ABIC score, a system that identifies patients with severe disease (r=0.44, p=0.01 and r=0.41, p=0.02, respectively). In addition, hepatic gene expression of Fn14 positively correlated with most of CXC chemokines gene expression (supplementary figure 1). Collectively, these results suggest that Fn14 could be implicated in the pathogenesis of disease severity in AH. We next studied Fn14 at the protein level. Fn14 staining was barely detected in normal human livers while it was mainly expressed in parenchymal cells around the fibrogenic areas in patients with AH (figure 4A,B). Because Fn14 has been reported to be expressed in progenitor cells in damaged tissues22 ,23 we next explored whether Fn14 was expressed in progenitor cells or in hepatocytes that derive from these cells. For this purpose, sequential liver sections from patients with AH were stained with anti-Fn14, anti-pan-cytokeratin (a marker of progenitor cells) and anti-EpCAM, a surface marker of human hepatic progenitor cells that is also expressed in newly generated hepatocytes derived from progenitor cells but not in mature hepatocytes.28 Fn14 was expressed in hepatocytes at the edge of regenerative nodules colocalising with EpCAM positive cells (figure 4C,D) and it was expressed only in a subpopulation of pan-cytokeratin positive cells (figure 4E,F). These results suggest that Fn14 is mainly expressed in a fraction of hepatocytes and in a subpopulation of progenitor cells in patients with AH. (A) Representative photomicrograph of a normal liver staining for Fn14 (200× magnification); (B) Representative photomicrograph of a liver with alcoholic hepatitis (AH) stained with anti-Fn14 (original magnification, ×400); (C, D) Immunohistochemistry of consecutive slices of livers with AH stained with anti-Fn14 and anti-EpCAM, respectively (original magnification, ×200); (E, F) Immunohistochemistry of consecutive slices of livers with AH stained with anti-Fn14 and anti-pan-cytokeratin antibodies, respectively (original magnification, ×200). (A) Hepatic Fn14 gene expression in mice with chronic and acute CCl4 administration and DDC diet treated and receiving acetaminophen (APAP) mice (see supplementary Materials and methods) (*p<0.05 with respect to controls); (B) Fn14 hepatic protein expression in control mice and in mice treated with APAP; Fn14 expression was detected in progenitor cells (arrows) and was weakly expressed in some hepatocytes (original magnification, ×400); (C) Hepatic Fn14 gene expression from mice with CCl4 administration, CCl4 plus binge ethanol (EtOH) gavage and binge EtOH gavage (see Materials and methods) (*p<0.05 with respect to controls); (D) Western blot analysis from the same groups of mice showed in (C). Representative western blot of phospho-p38 MAPK (Thr180/Tyr182), p38 MAP Kinase, phospho-AKT (Ser473) and AKT reprobed with GAPDH; (E) Representative immunohistochemical images of control and gavage EtOH administrated mice (200× magnification) using anti-NF-κB p65 antibody; NF-κB p65 was strongly activated in the liver of mice gavaged with EtOH in progenitor cells and in some hepatocytes as well as in inflammatory cells (arrows); (F) Fn14 hepatic gene expression in mice high precision-cut liver slices exposed to different mediators including TWEAK, TNFα, LPS and TGFβ1. TGFβ1 was the only mediator that increased Fn14 gene expression (*p<0.05). We next studied the expression of Fn14 in an experimental model of acute and acute-on-chronic alcohol-induced liver damage. Acute ethanol exposure strongly induced Fn14 gene expression (figure 5C) but not other TNFα superfamily members including TNFα, TRAIL and TWEAK (data not shown). In the acute-on-chronic model, Fn14 was also increased, but in a lesser extent than in the purely acute model (figure 5C). Moreover, we studied several signalling pathways potentially implicated in Fn14-induced biological effects. We found that p38, AKT and NF-κB p65 were activated in the livers of animals exposed to ethanol compared with control mice (figure 5D,E). We finally used high precision-cut liver slices from mice livers to investigate which mediators are involved in Fn14 upregulation in the injured liver. Liver slices were exposed to inflammatory mediators involved in the pathogenesis of AH (LPS and TNFα) as well as TWEAK and TGFβ1, a major fibrogenic mediator. Incubation of liver slices with LPS, TNFα and TWEAK did not increase Fn14 gene expression, while TGFβ1 increased its expression (figure 5E). The current study investigates the hepatic gene expression profile in patients with AH using a high-throughput approach. We performed a functional analysis of the hepatic transcriptome, which allowed us to identify several pathways potentially implicated in the pathogenesis of this devastating medical condition. Besides confirming some previous data13 ,24 we provide evidence that other novel biological pathways such as ‘TNF superfamily receptors’ and ‘ECM (extracellular matrix)–receptors interaction’ are potentially implicated in this disease. The results of this study could be relevant, since it could provide useful human data to research groups devoted to the study of ALD. Importantly, some of the results obtained in our study differ from those obtained in rodents exposed to alcohol (ie, the lack of hepatic upregulation of TNFα and its specific receptors).4 ,5 These discrepancies between human and experimental data reinforce the need to develop an experimental model that reproduces all the features of AH. Because current therapies (ie, corticosteroids) are not effective in many patients with severe AH,29 ,30 targeted therapies are urgently needed. In the absence of a well-accepted model of AH in rodents, studies in human samples seem mandatory. Our translational approach to identify novel therapies consists of analysing gene expression in the livers from patients with biopsy-proven AH. In all patients, liver specimens were obtained using a transjugular approach by an experienced team, which also allowed the measurement of portal pressure. We selected carefully the patients so it was not surprising that gene expression pattern was quite homogeneous throughout our series. It is important to stress that the study was performed in patients with the most severe form of ALD. Whether the results obtained in our study also apply to patients with moderate forms of ALD is unknown and deserves further investigation. The most striking finding of our study was the marked upregulation of several receptors belonging to the TNF superfamily such as Fn14, TRAILR1 and FAS in patients with AH. In contrast, none of the ligands including TWEAK, TRAIL, FAS ligand and TNFα were differentially regulated. Interestingly, we found that Fn14 was the only receptor exclusively overexpressed in patients with AH, while TRAILR1 was overexpressed in AH and NASH and TNFRSF1 and FAS were exclusively upregulated in NASH. Because of the specific overexpression of Fn14 in AH patients, we decided to further explore this TNF receptor. We first investigated whether Fn14 hepatic expression at admission predicts mortality in patients with AH. Fn14 expression was markedly associated with mortality rate at 3 months, suggesting a potential pathogenic role for this receptor in the pathogenesis of AH. Fn14 is the receptor for TWEAK, a cytokine belonging to the TNF superfamily that has powerful biological properties.31 Importantly, Fn14 is also able to signal in a ligand-independent manner when it is ectopically overexpressed in vitro.21 We hypothesise that in AH, Fn14 could act in a TWEAK-independent manner. In fact, experimental studies in precision-cut liver slices from mice showed that TWEAK did not induce Fn14 gene expression even if capable of inducing other pro-fibrogenic and pro-inflammatory genes in the liver (supplementary figure 2). Moreover, TWEAK serum levels were not increased in patients with AH. The mechanisms leading to Fn14 upregulation in AH are actually unknown. 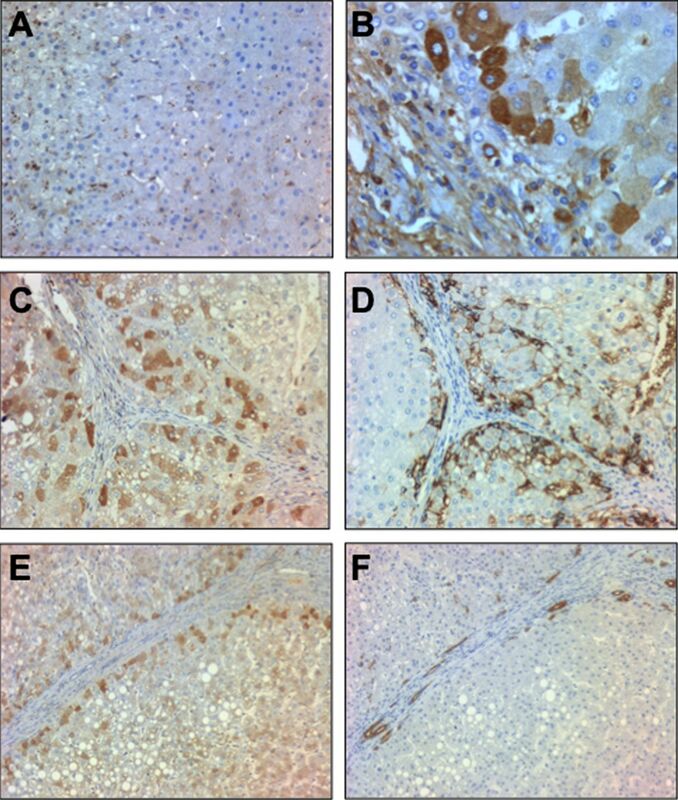 We showed that TGFβ1, a profibrogenic cytokine markedly increased in AH, increases hepatic expression of Fn14. This effect was not induced by TNFα, TWEAK and LPS, suggesting that fibrogenic, rather than inflammatory mediators, could regulate Fn14 hepatic expression. Recent data from our laboratory indicate that liver regeneration is probably impaired in patients with AH.27 Accumulation of hepatic progenitor cells correlates with patient mortality, suggesting a defect in the maturation process that generates functional hepatocytes in these patients. Because Fn14 is expressed in progenitor cells in damaged tissues,22 ,23 we explored whether Fn14 is also expressed in experimental models characterised by acute and chronic liver damage and progenitor cell expansion. In both models, we found a marked expression of Fn14. This finding, together with the colocalisation of Fn14 with progenitor cells and newly generated hepatocytes derived from progenitor cells in livers from patients with AH, suggests a potential role for this receptor in progenitor cell differentiation. 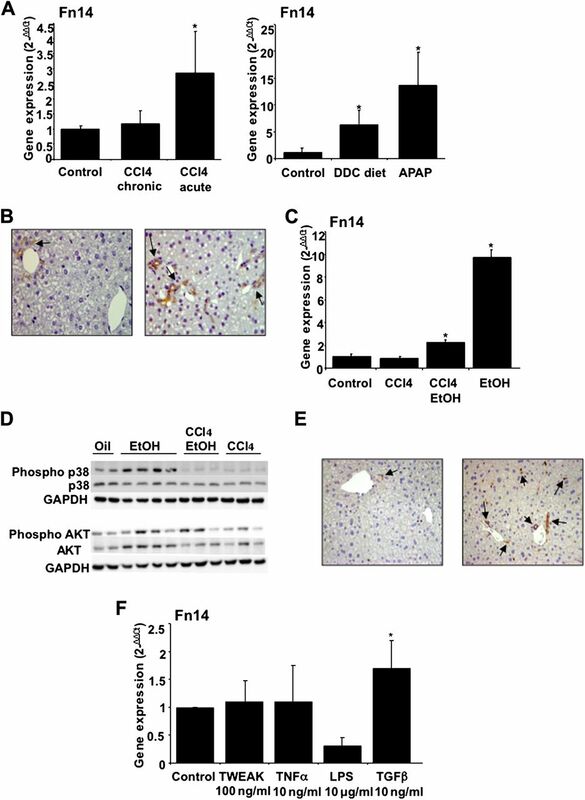 Importantly, ethanol administration to mice resulted in increased Fn14 expression, suggesting that alcohol abuse stimulates Fn14 expression in the liver. Functional studies modifying Fn14 expression in an animal model of AH are required to delineate the precise role of this pathway in AH. In conclusion, our study demonstrates that several pathways, including the cytokine–cytokine receptor interaction, may play a role in AH in humans. Among genes belonging to this pathway, we found that TNFα superfamily receptors are markedly upregulated. One of these receptors, Fn14, was exclusively overexpressed in AH compared with other types of chronic liver diseases and to control livers. Fn14 hepatic expression correlated with disease severity and degree of portal hypertension. Future studies in animal models of acute AH are required to delineate the role of Fn14 in liver injury and regeneration in this severe liver disease.
. Common pathogenic mechanism in development progression of liver injury caused by non-alcoholic or alcoholic steatohepatitis. J Toxicol Sci 2007;32:453–68.
. Cytokines in alcoholic and non alcoholic steatohepatitis. N Engl J Med 2000;343:1467–76.
. Antibodies to tumour necrosis factor alpha attenuate hepatic necrosis and inflammation caused by chronic exposure to ethanol in the rat. Hepatology 1997;26:1530–7.
. Essential role of tumour necrosis factor alpha in alcohol-induced liver injury in mice. Gastroenterology 1999;117:942–5.
. Mechanisms of alcoholic liver disease: cytokines. Alcohol Clin Exp Res 2001;25(5 Suppl ISBRA):251S–3S.
. Tumor necrosis factor and alcoholic liver disease. Alcohol Clin Exp Res 1998;22:248S–52S.
. Cytokines in alcoholic liver disease. Semin Liver Dis 1999;19:205–19.
. Tumour necrosis factor alpha is an important mediator of portal and systemic haemodynamic derangements in alcoholic hepatitis. Gut 2003;52:1182–7.
. Combination of steroids with infliximab or placebo in severe alcoholic hepatitis: a randomized controlled pilot study. J Hepatol 2002;37:448–55.
. Anti-tumor necrosis factor-alpha monoclonal antobody therapy in severe alcoholic hepatitis. J Hepatol 2003;38:419–25.
. A double-blind randomized controlled trial of infliximab associated with prednisolone in acute alcoholic hepatitis. Hepatology 2004;39:1390–7.
. Hepatic expression of CXC chemokines predicts portal hypertension and survival in patients with alcoholic hepatitis. Gastroenterology 2009;136:1639–50.
. Peripheral arterial occlusive disease: global gene expression analyses suggest a major role for immune and inflammatory responses. BMC Genomics 2008;9:369.
. Functional interpretation of microarray experiments. OMICS 2006;10:398–410.
. Gene expression profiling of alcoholic liver disease in the baboon (Papio hamadryas) and human liver. Am J Pathol 2003;163:2303–17.
. SMART amplification maintains representation of relative gene expression: quantitative validation by real time PCR and application to studies of alcoholic liver disease in primates. J Biochem Biophys Methods 2003;55:53–66.
. Intrahepatic gene expression in human alcoholic hepatitis. J Hepatol 2006;45:306–20.
. Fas-mediated apoptosis in acute alcoholic hepatitis. Hepatogastroenterology 2003;50:443–8.
. Raised plasma soluble Fas and Fas-ligand in alcoholic liver disease. Lancet 1998;351:1930–1.
. TWEAK induces liver progenitor cell proliferation. J Clin Invest 2005;115:2330–40.
. Tumor necrosis factor–like weak inducer of apoptosis is a mitogen for liver progenitor cells. Hepatology 2010;52:291–302.
. Hepatic expression of candidate genes in patients with alcoholic hepatitis: correlation with disease severity. Gastroenterology 2007;132:687–97.
. A new scoring system for prognostic stratification of patients with alcoholic hepatitis. Am J Gastroenterol 2008;103:2747–56.
. Design and validation of a histological scoring system for nonalcoholic fatty liver disease. Hepatology 2005;41:1313–21.
. Liver progenitor cell markers correlate with liver damage and predict short-term mortality in patients with alcoholic hepatitis. Hepatology. Published Online First: 25 January 2012. doi:10.1002/hep.25614.
. Epithelial cell adhesion molecule (EpCAM) marks hepatocytes newly derived from stem/progenitor cells in humans. Hepatology 2011;53:964–73.
. Glucocorticoids are ineffective in alcoholic hepatitis: a meta-analysis adjusting for confounding variables. Gut 1995;37:113–18.
. Do corticosteroids reduce mortality from alcoholic hepatitis? A meta-analysis of the randomized trials. Ann Intern Med 1990;113:299–307.
. TWEAK, a member of the TNF superfamily, is a multifunctional cytokine that binds the TweakR/Fn14 receptor. Cytokine Growth Factor Rev 2003;14:241–9. Transcript profiling: Microarray data have been deposited in NCBI's Gene Expression Omnibus (GEO; accession number GSE28619). Funding This study was supported by grants from the Instituto de Salud Carlos III (FIS PI080237, FIS PS09/01164 and FIS PI080126 to RB, JC and PG, respectively). SA received a grant from IDIBAPS. PS-B was funded by the Ministerio de Ciencia e Innovación, Juan de la Cierva (JCI-2009-03849) and by the Instituto de Salud Carlos III, Miguel Servet (CP11/00071). DR-T received a grant from the Ministerio de Educación, FPU programme. MD and JA received a grant from Fundación Banco Bilbao Vizcaya Argentaria. This work was performed in Centre Esther Koplowitz (CEK). Ethics approval Approval provided by the Ethics Committee of the Hospital Clinic of Barcelona, Spain.